In 1895, when tragedy strikes and the bank repossesses the Barrington sisters’ home, all hope is lost–until an orange farmer in California secretly arranges for them to head out west to become mail order brides for his three sons. Will the Wallace brothers welcome the Barrington sisters with open arms? 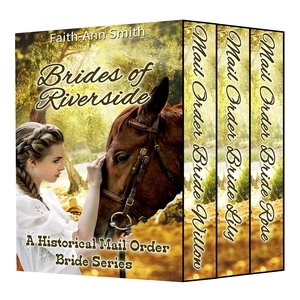 Find out in Brides Of Riverside, a historical mail order bride series by Faith-Ann Smith. Book 1: Mail Order Bride Willow: When the bank repossesses the house, Willow, the eldest of the clan–and a determined spinster–tries to be optimistic but begins to lose faith when their situation takes a turn for the worse. When her cousin from California offers to make an arrangement for her to marry the son of a man out west, Willow has no choice and accepts. When she meets Joshua Wallace, however, she decides that he is unsuitable and their personalities clash. Joshua comes from a prominent family in Riverside, but prefers to live as a recluse on the wide open plains. He has a wolf for company and has taken five orphans from a nearby reservation under his care. Can they both find a way to live in peace and keep their sanity intact? Book 2: Mail Order Bride Lily: Lily is a soft-spoken girl with a large heart. When she receives her invitation to travel to California, she is eager to go, despite her fears. She quickly falls for her betrothed, Jasper Wallace, but her love is unrequited. When his father asks him to make Lily his bride, Jasper plans to get out of the engagement as soon as he can, but Lily’s heartfelt personality soon begins to intrigue him; not even the vibrant Daisy May Meriwether can keep him away. When Lily is bitten by a snake, Jasper is terrified of losing her and vows to become a better man. Will his prayers be heard in time, or will he tragically lose the woman of his dreams? Book 3: Mail Order Bride Rose: When kind-spirited Rose is asked to travel to Riverside and become the bride of Joseph Wallace, she is eager to accept. She admires Joseph from the moment they meet, but she can tell that the feeling is not mutual. Joseph is emotionally scarred from a broken heart. He now feels that all women can’t be trusted, so when he meets Rose, he devises a plan: to ask for her help in opening a new restaurant, and then to dismiss her after its grand opening, never looking back. Little does he know, however, that Rose’s kindness and love will threaten to destroy the very fabric of Joseph’s deep-seated beliefs. Can he get over his prejudice and finally learn to love again, or is heart too wounded to heal?